As a retired Law Enforcement Officer and current NRA firearms instructor, I can tell you firsthand, there is no other readily accessible close-range powerhouse firearm on the market as devastating as the shotgun. Although mainly thought of as a sporting platform, it’s role in self-defense cannot be denied. 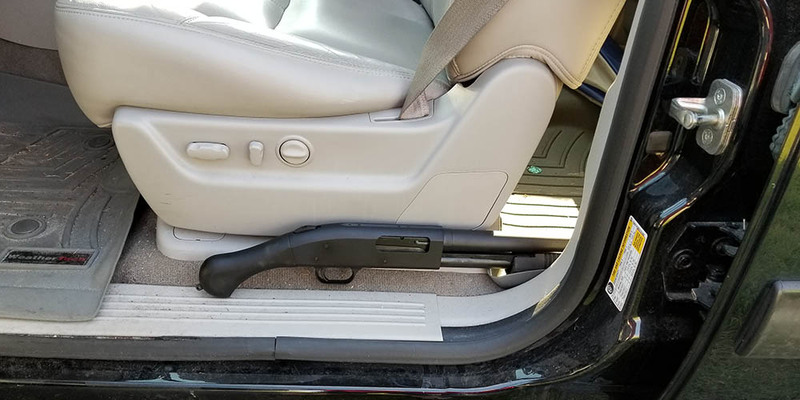 Despite the shotgun’s basic design being around for hundreds of years, it still stands as a variable “game changer” across the board in law enforcement, military and civilian use today. At extreme close range, a 12-gauge shotgun can knock a .75 caliber hole through a 1/4” of plywood and still keep going. Unfortunately, the bane of the shotgun platform in the defense market is the length of the firearm. Typically, if the company manufactures anything shorter than an 18” barrel and/or the entire firearm is under 26” overall in length, the buyer would have to go through the lengthy process of having to obtain a Federal Tax Stamp for the “Short-Barreled Shotgun (SBS)” or “Any Other Weapon (AOW)” classifications IF the state the buyer lived in even allowed them to be owned there. This puts shorter shotguns into a small niche market in which doesn’t translate to a wide spread self-defense audience. 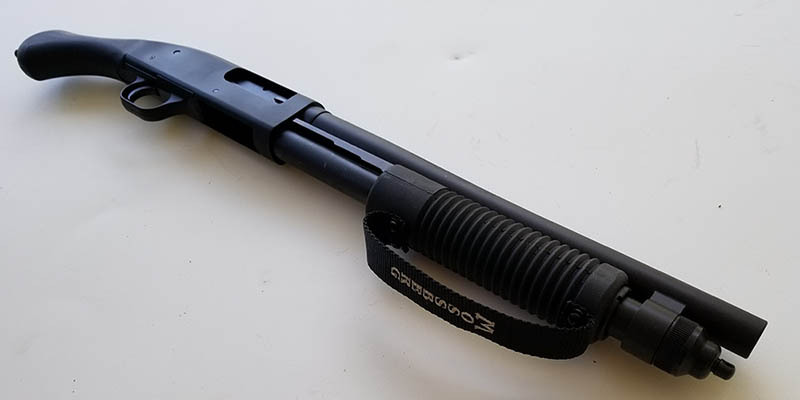 Thankfully, Mossberg found a way around this in last year’s new release, the Mossberg 590 Shockwave which we take a look at in this week’s article. Few models have served a wider and more reliable capacity than that of the Mossberg 590. 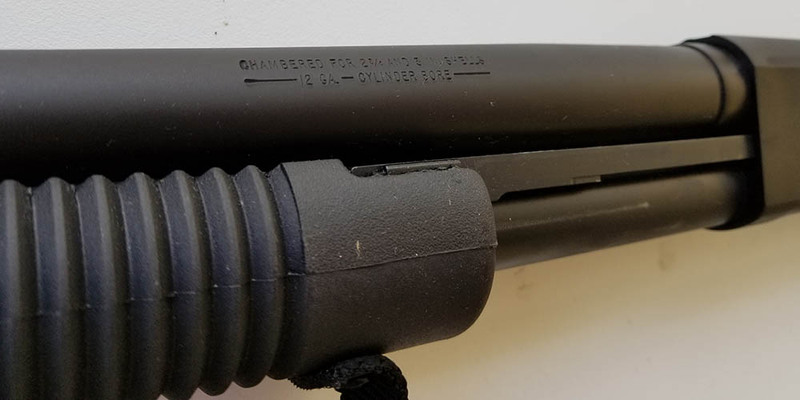 Building off the success of the Mossberg model 500, the 590 added a beefier receiver and double action bars similar to the 500’s counterpart on the market with Remington’s model 870. When Mossberg decided to build a hand held 12-gauge cannon, the 590 seemed to be a logical choice. By shortening the barrel to 14” and adding a unique angled bird’s head style grip rather than traditional pistol grip, it helped the new Shockwave design retain non-NFA status by making the 26” inch overall requirement. Basically, the ATF doesn’t consider the Shockwave a shotgun by law because it doesn’t have a stock, nor a pistol because it doesn’t technically have a pistol grip. When I first saw one in person during this year’s SHOT SHOW in Las Vegas, I HAD to have one! A few months after returning from SHOT SHOW, Mossberg released the Shockwave into full production and with that, our test sample arrived at my local gun shop for pick up. After a quick 20-minute round trip, I was back in my office opening the relatively short cardboard box Mossberg used to ship the Shockwave in. Upon opening the package, I had forgotten just how short the Shockwave was. Slipping my support hand inside the forearm loop and saddling up with my strong hand, the stance may have looked a bit odd, but it felt “right.” The Shockwave was well balanced with just enough heft to make you respect the fact you have a small .75 caliber cannon in your hands. Moving about through my home office and down the hall room to room with the unloaded Shockwave in my hands, I was impressed with how well it “sliced the pie” coming around corners and the overall “pointability” of the gun. (Additionally, if “pointability” is not a current word, it is now. You’re welcome!) It was clear during my room clearing scenarios, this was not a long arm but could not be implemented as a handgun. My field testing would need a bit of customization to properly see how the Shockwave would perform in real world application. Unfortunately, due to hurricane activity during the initial test period, it would be two weeks of staring at the Shockwave siting in my office between working the solid locking action over a hundred times dry firing 12-guage snap-caps before the water at “The Swamp” training grounds receded enough to field test. After all, we DO call it “The Swamp” for a reason. Eager to hit the range at our private training facility affectionately known as “The Swamp,” I called up fellow Swanson Media Group gun writer, Craig Reinolds and good friend, John Ammons, owner of UW Gear, makers of some of the toughest tactical rigs in the world. Both these men come from military and sporting backgrounds and are well familiar with the offensive power advantage the shotgun platform has. The following few days on the range with these two men would prove to be some of the most productive and fun trips I have had in a very long time. Overall, the general consensus once all shooters were able to handle the Shockwave was the finish, action and compact size of the firearm were excellent. The Shockwave represents all the things most combat shotgun shooters love in a 12 gauge firearm. The dual action bars cycled smoothly as it sent rounds into battery flawlessly. The firearm’s overall size allowed each shooter to gain an aggressive stance with the Shockwave. The best way to mount this firearm was to hold it along the support arm using the front hand as a way to point onto target. Meanwhile the strong hand ran out in front of the eye line several inches away from the jaw to prevent eating the unique bird’s head grip during recoil. This offered a very fast presentation on target and delivered the best accuracy. First up, we loaded the Shockwave up with Federal Premium 2 ¾ inch 12 gauge #8 shot 1 1/8 Oz. shot commonly known as birdshot. While birdshot has often been shunned in the defensive world as a viable load, I offer this in counter. Coming from a long career in Law Enforcement, I disagree wholly for two reasons. First, for some, birdshot may be the ONLY thing a very young, elderly or disabled person be able to control. Secondly, the lighter load offers a faster, more controllable follow up shot in which NO ONE can disagree with the close-range results of multiple birdshot injuries. My first shot on target with the birdshot load was sent high and literally sawed a 1”x2” board used in the target stand in HALF. Feel free to take a look at that segment of the accompanying video and keep in mind those who don’t think birdshot has a place in self-defense. Both John and Craig had an easy time of scoring solid hits once the correct shooting positions were obtained. The Shockwave performed perfectly as expected. Moving on to a stronger, more powerful load, I went with Federal’s 2 3/4’” 12 gauge Vita Shok 15 pellet copper plated magnum 00 buckshot. This is a very standard load out for military and law enforcement personnel. To say this is a powerhouse is an understatement. It didn’t take many rounds of this full 1 ounce load combined with a morning of shooting before my forearm and wrist began to get sore. On the plus side, the shot patterns are much tighter and deadly out to further distances. I will note, the Shockwave will chamber 3 inch magnum buckshot as well, although this is NOT my first realistic selection with a non-buttstock equipped firearm. I suggest surfing YouTube for some idiot with a slow-motion camera and less common sense when it comes to self-defense. Craig is roughly the same height with the same reach as me. The results from his series of shooting were nearly identical to my earlier sessions on the range. The Shockwave was referred to as “quite a handful” by Craig but he enjoyed the ride! Due to John’s longer reach and taller frame, he was able to stay on top of the Shockwave and really run it with top results. John placed shot on top of shot from 3, 5, 10, 15 and 20 yards comfortably and accurately. I believe it was love at first sight between John and the Shockwave. At typical across the room and down the hall distances, the patterns did not exceed 6 inches. Multiple shots into center mass left only a hole large enough for me to put my fist cleanly through. Unlike the birdshot, I would trust this load out to 20 – 25 yards out of the Shockwave. For the last series of test, I switched to a completely different take on defensive ammunition from Aguila in the form of small, 1 ¾ inch Mini-Shell Buckshot. These diminutive rounds are packaged 20 per box and retail for around $18. In order to flawlessly feed these into the Shockwave, a small rubber insert was used to act as a buffer the area behind the loading elevator to limit the rounds traveling rearward when the action is cycled. This insert is aptly named the Mini-Clip adaptor by OPSol Texas, and it retails for $15. It is designed to give “well-seasoned” and “recoil sensitive” shooters the capability of shooting the trusty Mossberg 12ga platform without the usual recoil response. By using The OPSol Mini-Clip in conjunction with 1 ¾ inch shotgun shells from Aguila, shooters stay in the game longer without all of the pain. The shells are loaded with less power and roughly half the lead as a standard 00 Buckshot round. As an added bonus, the Mini-Clip also works with Mossberg’s 500, standard 590 / 590A model shotguns as well as the Shockwave so its uses offer a wide range of future possibilities. Eager to see if the Mini-Shells would live up to all the hype, I loaded up the Shockwave and got to work. Immediately, I was impressed. I was able to fit 8 rounds into the magazine tube versus traditionally only being able to load 4 of the larger rounds. When it comes to sending rounds downrange in a gun fight, twice the number of available shots is never a bad thing. Recoil made the 12 gauge feel like a small .410 shotgun. The front bead was still lined up and ready for each shot afterwards while staying on target or what was left of it. 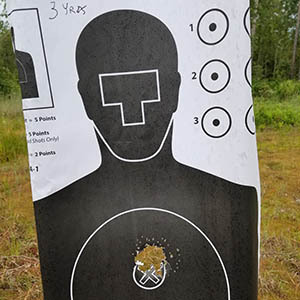 Through 40 rounds down range, the Shockwave / Mini-Shell combo worked flawlessly with a bit of a surprise as to how well the buckshot held its pattern out to 7 yards, or the “down the hallway” self-defense distance. Multiple head shots and center mass shots held within the vital zone without a single flyer. I have some traditional loads I have used for the same purpose that I can’t say performed as well. While the lower recoil of the Mini-Shells will NOT cycle a semi-auto shotgun, military, law enforcement and civilians who rely on the traditional pump action platform will enjoy the reduced abuse to joints, added control for follow up shots and doubled magazine capacity. As of now, the only drawback to using the Mini-Shells is the difficulty finding them locally. As their popularity grows, this will issue will more than likely correct itself. In winding down my look at the Mossberg Shockwave, I have a few lasting impressions. First, the overall compact size of the Shockwave and it’s 14” barrel allows for it to be carried in ways a traditional shotgun cannot. Whether it’s the dash or between the car seat and interior wall of your vehicle or just inside the closet above the door, the Shockwave can be easily deployed. Secondly, even with full power 00 Buckshot, the Mossberg proved it could deliver controlled vital zone hits at across the room and down the hall distances. Lastly, due to the 590’s construction, it is easy to clean and maintenance by the end user without special tools or training. All these factors are equally important to me in choosing a home defense firearm. Given recent events happening around the country, gun legislation has become a hot topic yet again. 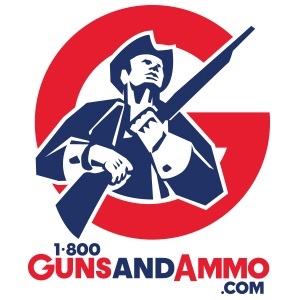 With the Shockwave viewed by some as a circumvention on the Short Barreled Shotgun regulations, a lot of people have been buying 590 in high volume. These buyers typically have a “Get them while you can” mentality, believing the Shockwave may the first of the firearms banned. To Mossberg’s credit, they have been able to keep up production numbers and stores supplied well. Retailing for around $455.00 ($339.99 at 1800GunsAndAmmo.com), the Mossberg Shockwave comes in at the lower end of the home defense firearm spectrum. This gun offers solid, dependable performance and quality for much less than a traditional handgun that doesn’t offer a quarter of the firepower. The heavy wall construction of the 590 combined with an ambidextrous safety, dual extractors, positive steel-to-steel lockup, twin action bars, and a smooth operating anti-jam elevator give the user confidence in the Shockwave never failing when needed most. Held together with only two large pins, the Shockwave is easy to fully break down for maintenance. The magazine end cap is easily removed to wipe out the mag tube as well as the follower and spring. At the end of the testing period, not only did I enjoy reviewing it, I ended up purchasing the test sample for the office. Although I carry my Glock 19 everyday concealed, it is nice to know that when I am out and about with my wife and daughters, I have an added bit of firepower in the Suburban in case of car jackings or violence taken to the streets. With my wife, Candace also being an accomplished shooter and NRA firearms instructor, my kids enjoy the added bonus of rolling with their own two-person VIP protection team called Mom and Dad. From across the room or the perimeter of a vehicle, this combo will do the job! 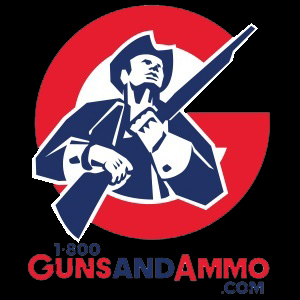 I urge you to take a look at the wide range of Mossberg products offered by 1800GunsAndAmmo.com and discover which may be right for you. Until next time, Train Hard, Continue the Fight! !